Laura Timmis is a PhD Student within CHEME at Bangor University, supervised by Professor Rhiannon Tudor Edwards and Professor Valerie Morrison. After graduating from Bangor University in 2008 with a first class honours degree in Psychology, Laura worked in various roles with vulnerable populations. After graduating from her Health Psychology Master’s Degree with a distinction in 2014, Laura started her PhD studentship at Bangor University (funded by Tenovus Cancer Care) in October 2014. 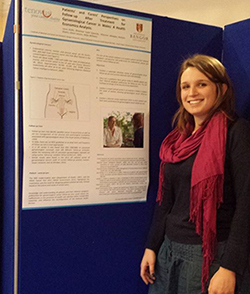 Laura’s PhD aims to identify Patients’ and Carers’ preferences for gynaecological cancer follow up after treatment care in Wales, from a Health Economics perspective.